Republican Shannon Grove currently represents Assembly District 34 and will be termed out in 2016. This will be an open seat in 2016 and a Republican is very likely to be elected. 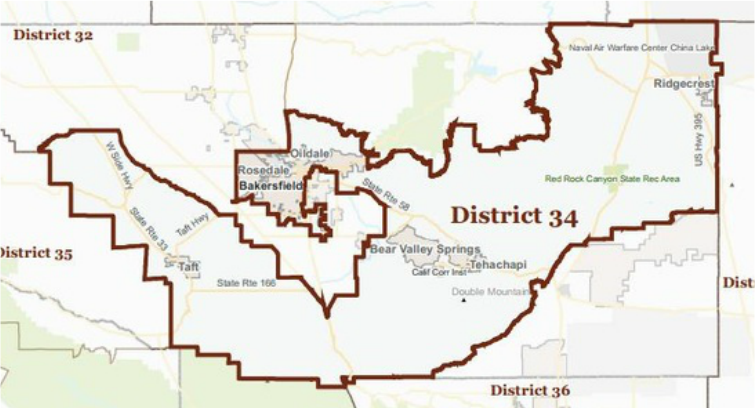 Shannon Grove represents the 34th Assembly District encompassing the majority of Kern County. She was first elected to the California State Assembly in November 2010, and overwhelming elected to second and third terms in 2012, and 2014. Shannon was born and raised in Kern County and graduated from Arvin High School. She joined the United States Army after high school and served in Frankfurt, Germany. She and her sister-in-law founded Continental Labor and Staffing Resources in 1993 and today Shannon presides as the company’s Chief Executive Officer. As the first woman veteran to serve in the Assembly and because of her dedication to the Kern County veterans, Shannon was named to the Assembly Committee on Veterans. Shannon’s committee assignments also include the Assembly Budget Committee, where she is an outspoken advocate for fiscal responsibility and restraint. A longtime business owner, Shannon first became active in the political process to advocate for worker’s compensation reform. As a result of her two-year participation in promoting this change, she was honored with the California Legislature’s "Small Business Award" in 2005 by then-Assemblyman Kevin McCarthy. Shannon is a member of the Brimhall Road Assembly of God. She resides in Bakersfield with her husband Rick, and they are the parents of 5 grown children.